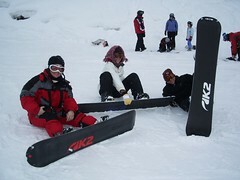 Kristen, the Ashman and I tried out snowboarding for the first time. It was great. Lots of bruises and sore muscles but it was totally worth it. Went back on the skis today though as it is better snow for skiing. Plus I have a bruised tailbone and I don’t want to hurt it anymore just yet. Next entry: Happy Birthday Dad!! !